That red and white palace was a Museum of the History of the Great October Revolution in the 1970's. When Stalin had Tverskaya widened I believe they moved the palace back and added the extra story mentioned above. If I remember correctly the building had these sad lions in front that looked like more like big mean dogs than cats. The palace you describe is the former English Club (Tverskaya 21) built originally in 1780 destroyed in the fire by Napoleon and renovated by an architect Menelas. Stylistically it belongs to Russian empire. English Club was an exclusive club for Russian nobility residing along Tverskaya. After the revolution of 1917 it was occupied by Revolution Museum, later it became an exhibition of presents offered to Stalin. Now it is the Museum of Modern Russian History. The lions guarding the entrance were a trendy accessory of a city mansion in the beginning of 19th century. It is particularly amusing because muscovites never saw a single lion. A notable exception took place when a couple of lions was presented to Russian Tzar Alexei Michailovich long before English Club. As for the Palace of Governor General of Moscow (Tverskaya 13) you are referring to it was originally built in 1778-82 as the palace of General Governor count Chernyshov by the well-known Russian architect M.Kazakoff. The ancient bricks of recently destroyed city walls were used. The palace is an example of late Russian classicism. After count Chernyshoff death in 1784 the palace was purchased by State and since then it became the official residence of Moscow’s General Governors. After the revolution of 1917 palace was occupied by Soviet administration, the place in front of it was named Sovietskaya and decorated with the gypsum monument to Revolution. The palace was renovated in 1929-30th years during the reconstruction of Tverskaya street. It was moved to 13 meters in deep of the site. Later in 1946 2 floors were added to existing building by the architect Chechulin. 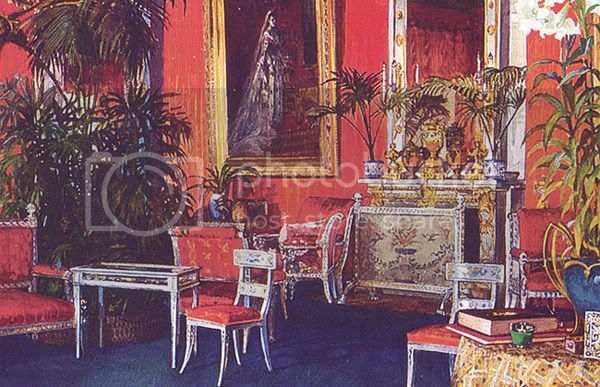 The walls were painted in red and classical details in white (the original palace was yellow and white which were the traditional colors of Russian classicism). The interiors were also renovated, however original main staircase by Kazakoff is retained as well as White and Red Halls. The ceiling paintings of the original palace were restored by the Soviet painter Korin. About monument in front of the palace. 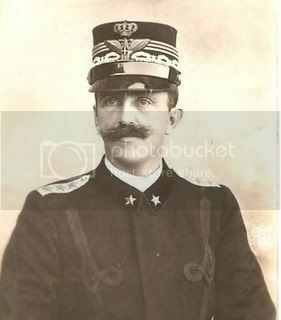 The square was named Skobelevskaya in honor of the hero of Russian-Turkish war general Skobeleff, an equestrial monument to whom stood in the centre. The Soviets replaced general by the sad gypsum woman, symbolising Revolution. The severe weather quickly destroyed sad symbol, and the place was empty until 1960th when it was decorated by the equestrial figure of Yuri Dolgoruki. Nowadays the palace belongs to Moscow administration. 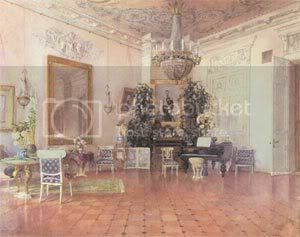 Once I saw a watercolor showing Sergei's dressing room in a palace of Moscow. Does anyone have it? I am looking for it, but cannot find it. For some who loves litterature could read the well known russian (anrachist ) author Savinkov. Savinkov who writes about his own experience as an anarchist has longly spied Sergei's home in the hope of catching some of the highest information for the succeed of the " operation". I wonder who is in the portrait on the wall? 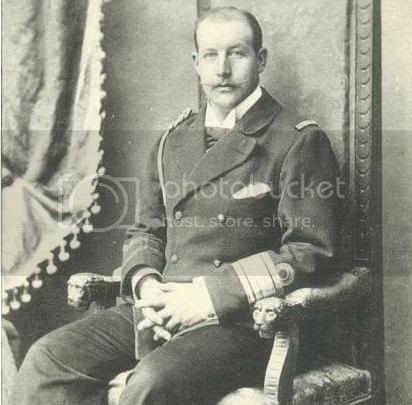 Empress Maria Fedorovna? or GD Ella? Svetabel - a million thanks for posting those watercolours. 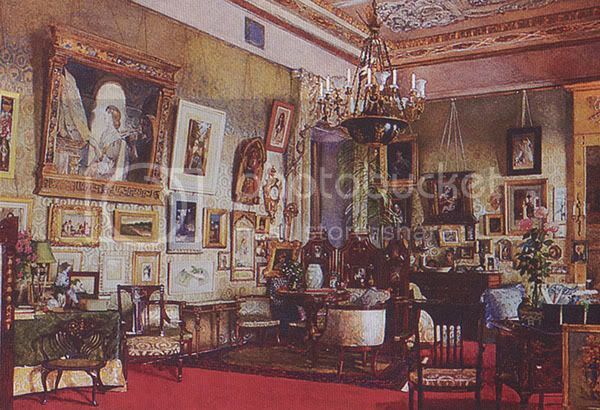 Grand Duchess Elizabeth Feodorovna's drawing room has her stamp ALL over it. THANKS A LOT the same . as you know I love watercolours!!! I think it's Maria Fedorovna, but I am not a great expert. 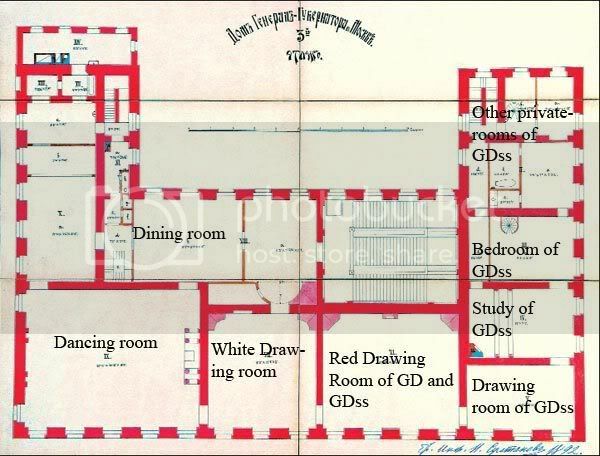 And 2 floorplans of the Mansion - 1t and 2nd floors - appartments of Grand Duke and Grand Duchess. And that have been demolished,what a pity,it is just wonderful! 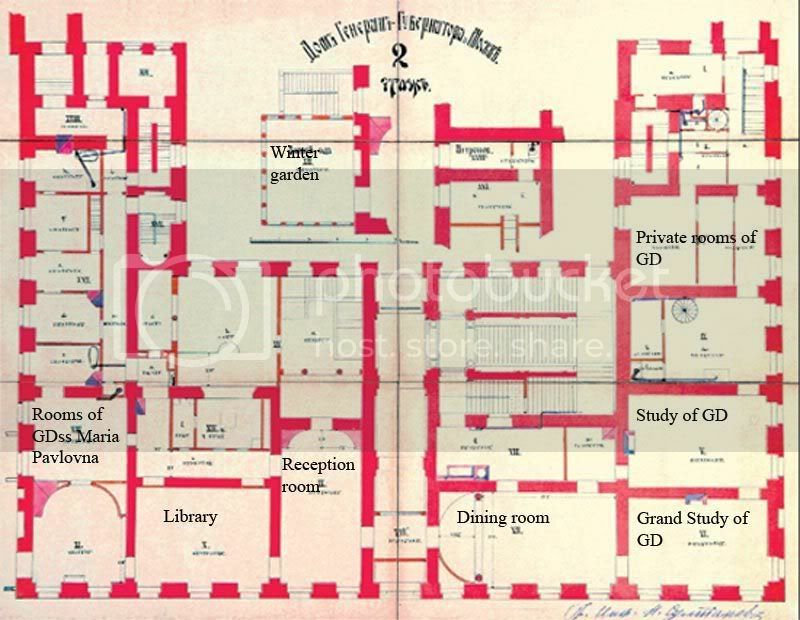 Thank you so much for posting the plans of the Governor General's Palace. You always find the most interesting items to post. I do have a guestion that your source (or you yourself) might be able to answer. On the floorplan the front facade of the building has 15 window openings (and I assume on the 1st floor 14 + the main entrance. However pictures I have seen of the palace today show only 12 + the main entrance. It looks like the central entrance and facade were greatly altered and three of the windows were replaced by the large central French doors within the arch. Can you confirm this? Is there any description of what was altered on the building when it was moved back and renovated? Thanks again for your wonderful posting. As usual, you add so much to the site. Bob, thanks for you kind words. As I know the building was reconstructed in 1944-1947 years and the front facade was changed. Another wonderful picture! I can just see a tiny bit of the Winter Garden on the left side of the building! It is so exciting to see the building exactly as it was shown in the floorplans. Thanks so much!